Houston Texans general manager Charley Casserly was quoted Sunday that the possible trade the Texans’ first round pick might help the Texans fill multiple positions. There's clearly players at the top of this draft that are marquee players. Players that are impact players, players that are going to go to the Pro Bowl, players that are going to sell tickets. We're going to get offers for this pick. We've already had discussions with teams. I think there's value in our pick. 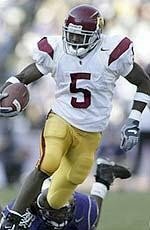 It has been widely expected that the Texans would select Heisman Trophy winner Reggie Bush. When the Texans gave quarterback David Carr a three year contact extension, it sent a clear message that he was not part of the problem with the Texans’ offense. I just cannot figure the thinking of the Texans’ front office. They fire their head coach, but keep the general manager. It just doesn’t make sense. Keep Casserly and possibly trade the first round pick. I just don’t get professional football. Oh well, at least the Astros won the National League and went to the World Series this past year. I guess the Texans will continue to be the only professional team in Houston without any type of championship. Del Rio’s Todd Hays declared his intent to retire for bobsled before posting his final two runs in the four man event at the Winter Olympics in Turin, Italy. He has stated he would like to coach football, perhaps with his brother at Baylor University. A word of advice to the coaching staff at Baylor: HIRE THIS GUY! Imagine the motivation and work ethic that Hays could bring to the program? Anytime you can get an Olympian from any sport to contribute to your program, one must jump on it. Hays is a class act, and would be a welcome addition to any program. Besides, he may be able to recruit some football players to go out for bobsled after their collegiate careers are over. He is a great athlete; a great Olympian; a great Texan; and a great American. We need more people like him coaching in the college ranks. In a recent article by Tom Reed of the Akron Beacon Journal, he stated that Olympic spirit is lacking by some members of the USA Olympic Team competing in Turin, Italy. Much has been written about the Davis-Hedrick feud, Bode Miller’s attitude and failure to perform, Lindsay Jacobellis’ hot-dogging that cost her the gold medal and Mike Modano ranting and raving about USA Hockey. I would like to take his article in a slightly different direction. When did it become acceptable not to show the proper respect when your country’s flag is raised and national anthem is played? For many years, it has become accepted by people in the United States that proper respect (standing, removing one’s hat, placing your hand over your heart, and singing the National Anthem) is not necessary and is simply a matter of choice. As I write, I know some will read this and think it is none of my business. One may chose to show respect in any way they desire. I viewed two separate incidents dealing with this exact topic in the past week. Two very different incidents and neither involved the USA. At the Olympic Games, when Italy’s men’s speed skating pursuit team received their gold medal and their national anthem was played, all four men placed their hand over their hearts and sang the Italian national anthem. All the Italians witnessing the ceremony sang with them. It was a truly moving event. They were proud to win. They were proud for themselves, their country and all fellow Italians. They were proud to show how much they loved their country. The second incident occurred at a soccer match between Jamaica’s Portmore United and Mexico’s Club America. The match was held in Houston at Minute Maid Park this past Wednesday, February 22. While the national anthems of both countries were played prior to the start of the game, I rose from my seat in the press box to show proper respect. I am not a citizen or either country, but I rose to show proper for their country, as I have done my entire life. I was taught at an early age if you don’t have respect for others and their beliefs, they will not have respect for yours. As the Mexican anthem was played, the entire Mexican team, along with their coaches and support staff stood and preformed a salute with their hand and forearm over their chest to show respect for their flag. They all sang the Mexican national anthem, along with their supporters in the stands. I have been watching nonstop coverage of the Olympics, not only on NBC but also on the internet. The United States has won nine gold medals in these Games. Of the nine gold medalists, I wonder how many of them showed the proper respect for our country and flag, when receiving their gold medal. I know many out there with think what does it matter? But it does matter. It matters to me, the proud son of a veteran of World War 2, the Korean War, and the Vietnam War. Has patriotism died in this country? Do we all think it is fine not to show proper respect for one’s country? I certainly hope not. I looked for three things when USA Olympians receive their gold medals. Mind you, I was unable to see all the medal ceremonies. I have listed only the ones I personally witnessed. A. The athlete removed his/her hat when the national anthem was played. C. The athlete sang the national anthem when it was played. The USA gold medalists are listed below, along with my personal observations. Please post your observations and comments and I will compile the results. A. Yes (his headband was on, however, I don't consider that a hat). As in any survey or poll, this is unscientific and is strictly for informational purposes. I know some will think that I want to find out this information so I can attack those, who did not do these things, as unpatriotic. That is not my intention at all. I just would like to see which one did them. After all, if athletes from Italy and Mexico can show a certain measure of respect for their country, we all should find it our duty as American to do the same. In a first ever soccer event for Minute Maid Park, Mexico's Club America defeated Jamaica's Portmore United by the score of 2-1 in the first leg of the 2006 CONCACAF Champions Cup this past Wednesday, February 22. After battling to a scoreless tie at the half, Portmore took a 1-0 lead on a goal in the 51st minute off a kick by Kemeel Wolfe. Club America's Aaron Padilla evened the score in the 61st minute followed by the game winning kick of Miguel Angel Zepeda in the 73rd minute. Both teams will meet again in the second-leg of the Series 1 at the Estadio Azteca in Ciudad de Mexico on 8 March. The 2006 CONCACAF Champions' Cup continues on Thursday when the Los Angeles Galaxy (USA) host Deportivo Saprissa (CRC) in the first-leg of the Quarterfinal Series 4 at the Home Depot Center in Carson, California USA. Saprissa are the defending CONCACAF title holders, while the Galaxy are the last US club to win the Champion' Cup. The Semifinal victors will play for the 2006 CONCACAF Champions Cup on 11-13 & 18-20 April with the winner also qualifying to the FIFA Club World Championship in Japan later this year. The Champions Cup Runner-up will be one of the three CONCACAF invitees to the 2006 Copa Nissan Sudamericana. The CONCACAF Champions Cup is the longest running international club competition in the region and has crowned the champion club of the Confederation since its inception in 1962. Jeff Bagwell reported to Astros Training Camp in Kissimmee, Florida today and the first person he ran into was owner Drayton McLane. The 15-year veteran half-joked he felt he was at a tryout camp attempting to show Astros management that he is worthy of a spot on the squad. Bagwell took grounders at first bases along with Lance Berkman and during the session threw about 15 times back to home plate and third base. I believe if I can get out there and play. I will be one of the best 25 players, there's not a doubt in my mind. It's whether or not I can do that, whether I can actually get out there and play. If I can get in the batter's box for 500 at-bats, I promise you I'll be one of the best 25 guys out there. In January, the Astros filed an insurance claim, stating that Bagwell was a disabled player who can no longer field his position. Bagwell wants a chance to prove himself. To prove to himself, the Astros and other that he can perform at the level that is necessary to continue to play in the professional ranks. I understand the business side of baseball. If I cannot play baseball this year and I am physically unable to play with the Houston Astros, trust me, I want them to collect as much insurance as they can. I'll write the letter. That's not an issue for me. But I just want the chance to see if I can play. I say give him a chance. He has been a loyal Astro for 15 years and loyalty is important in sports. I know this is professional sport, but what could it hurt? One never knows. He may surprise a large number of people. When I was very young and I would hear her say that, I never really knew what she meant. I thought because she lived her early years in West Virginia and the area was prone to flooding; it meant to keep away from the rising water. Not to put yourself in a situation where you can cause yourself and your loved ones any harm. As I grew older, I came to know the true meaning of her code. A day doesn’t go by that I don’t think about it. It is very obvious to me that one your man in Turin, Italy took that code to heart. Chad Hedrick and Shani Davis finally shook hands. A simple handshake. That was all it was. But it spoke volumes. And that is what people love to see. Was it a show of respect or a show for the cameras? That is anyone’s guess? But Wednesday night, at the Piazza Castello, the handshake happened. The handshake that the previous day Davis stated would have liked to receive after his 1000 meter victory. As Davis stepped up on the medal platform to receive his silver medal for the 1500 meters, Hedrick reached over and shook his hand. Actually Hedrick had to reach up, as he was on the bronze medal platform, but this handshake was a gesture, and it made everyone happy. In fact, Hedrick actually used gold medalist Enrico Fabris as a guardrail as he leaned over to offer the handshake. A happy Fabris smiled and gave both a high-five. This was a pleasant change for the previous day’s post race press conference. Opinions were given and hostility was evident as Davis stormed from the conference, obviously upset. “It started to become a soap opera in there, so I decided to leave,” Davis said. The two had not spoken to clear the air, though Davis seems to leave the door open for the prospect after the Olympics. "Whatever happens, happens. I'm open to anything. It's just too bad that things got blown out of proportion the way they did. It shows that we're not perfect as human beings. None of us are perfect." Davis even went further to state he is pulling for Hedrick to win the 10,000 meters. "I'm still rooting for him. He is an American." So the saga goes on. Two young men very entrenched in their ideals. Conflicts were bound to occur. What will happen from this point on is anyone’s guess? I can assure you of one thing. One young man took the high road today. It doesn’t matter the reason. That is always the road best traveled. My grandmother knew it, I learned it, and he experienced it. That young man and everyone involved will reap the benefits for it for years to come. Chad Hedrick was interviewed by Matt Lauer on NBC’s Today this morning. They discussed his bronze medal performance in the 1500 meters and the “difficulty” between him and fellow USA speed skater Shani Davis. Hedrick praised Davis and even said he was happy for Davis’ silver medal performance. He stated that he and Davis have different views on things, and he felt betrayed by Davis’ refusal to participate in the team pursuit. After the interview, Lauer said that Davis was also invited by NBC to appear and chose to decline. After Davis’ actions in the post race press conference yesterday, there is no wonder he chose to decline the interview. He cannot seem to get the idea that you must present a positive image to the public in order to be viewed in a positive light. I am not saying that NBC has the best coverage of the Olympics. It does treat athletes and teams in different ways. However, they are the main media source for people in the United States on the Winter Olympics Many of those same people will take what is presented by NBC as gospel. Many of the posts on this site and others are defending Davis and chastising Hedrick. I just don’t see the logic of the views. Davis is a loner and has alienated himself from his fellow USA speed skaters. For him to say it would have been nice to get a handshake from Hedrick after his victory sounded like a desperate attempt to salvage some dignity and perhaps to be considered part of the team. In order to be part of a team, you need to embrace the team concept. Being a part of the team means contributing to the team effort, living in the same area of the Olympic Village as your teammates, supporting all your teammates, and placing the goals and objectives of the team first in one's priorities. That is what being part of a team is about. The post race press conference yesterday and the NBC interview today would have been a perfect opportunity to do that. He CHOSE not to participate in the team pursuit. He CHOSE to bring up the conflict at the press conference. He CHOSE not to participate in an interview with NBC. He had the free will to make those choices. To continue to put forth the negative attitude and behavior he has exhibited in Turin, it is obvious to many that his CHOICES are not reflecting positively on him. As I have stated before. He just doesn’t get it. His supporters just don’t get it. I guess they never will. The University of Houston is hosting the Conference USA Swimming and Diving Championships at the Student Recreation and Wellness Center Natatorium begining today (February 22) and continuing through Saturday, February 25. Seven schools will be competing, with six women’s teams and three men’s team vying for conference honors. In the women’s division, SMU, Rice, East Carolina, Tulane, Marshall, the University of Houston, while SMU, Hawaii and East Carolina compete in the men’s division. Title 9, and the way university officials view its implication hinder men’s programs in swimming. Conference USA has twelve member schools, but only six field women’s teams and a paltry three field men’s teams. The number of women’s team reduces to five for the 2006-2007 season, as Tulane will drop its three year old women’s program. However, the action will be hot in the pool this year, as SMU looks to be the odds-on favorite to win both the men’s’ and women’s titles. Go and check out the action. For the price, it is the best deal for collegiate sports in town. For further information on the championships, go to Conference USA Swimming and Diving Championships website. In an article on the Mercury News website, George Diaz of the Orlando Sentinel, describes the scene at the press conference after the 1500 meter speed skating race in which Shani Davis won the silver medal and Chad Hedrick won the bronze at the Winter Olympics in Turin, Italy. They both assured everyone that there was nothing between them except competition, but the festering boil that is their conflict is going to pop soon. Remember Tonya Harding and Nancy Kerrigan? Was it Tonya the thug and Nancy the princess or Tanya the used and Nancy the whiner? People couldn’t turn on the television without seeing their faces. Think what would have happened if the internet has been involved? Shani and Hedrick are headed for that same abyss. Yet another view on the post race interview also came from the Mercury News site, showing a different view of the two. As I watched the individual interviews that NBC’s Melissa Stark conducted after the race, both Davis and Hedrick were polite, pleasant, and praised each other. However, when NBC showed the ending moments of the final post race press conference, Davis brought up that he felt it would have been nice if Hedrick had shaken his hand after his victory. The camera panned to Hedrick, who picked up his bottle of water, stood up, took a drink, and sat down. At that moment, according to sources, Davis got up and left the conference; mumbling something to a companion about Hedrick. Hedrick looked in Davis’ direction, shook his head, and also according to sources, stated something such as "That's just like Shani." I am sorry. Shani has said over and over that he is in it for his performance and couldn’t care less what people think and say. Now for him to say a congratulatory handshake from Hedrick would have been nice just muddles the matter even more. Many have stated that Shani is not and does not consider himself a part of the USA team. Having removed himself from the team atmosphere, one would assume that being a part of the team is not important to him. To state that it would have been nice to get a handshake and congratulations from Hedrick after his race seems out of context. Does he want to be part of the team or not? Expecting congratulations from a fellow skater means you consider yoursself part of the team. Whether his decision not to skate in the team pursuit was the straw that broke the camel’s back or was just more fuel for the fire is yet to be determined. But one think is certain, you can’t have it both ways. Be a loner or be a team player. But you need to pick one and stick with it. Shani needs to remember what happened to John Kerry with his constant flip-flopping during his presidential race. It didn’t work out to well for Kerry, and it might not work out for Shani. No matter what anyone things about either of them, they have brought speed skating to the thoughts and mouths of the world. And that is always good for a story. On the ESPN SportsNation website, there is a poll concerning the ongoing feud between USA speed skaters Shani Davis and Chad Hedrick. Take the time to visit the site (highlighted above), read the article, and take the poll. As in any online poll, the results are not scientific, but it does give the reader a chance to voice their opinion and see how it related to others. Davis, Hedrick Both Denied Gold Medal In 1500 Meters. Italy’s Enrico Fabris showed what he was made of defeating both Shani Davis and Chad Hedrick in the 1500 meter speed skating event at the Winter Olympics in Turin, Italy. Fabris posted a time of 1 minute, 45.97 seconds in the seventeenth pair of skaters. He then waited to see if anyone could overtake him. Hedrick, who skated in the twentieth pair, recorded the time of 1:46.22, knew it would not be enough when he crossed the finish line. Davis posted the time of 1:46.13 in the final pair. He then skated a victory lap with Fabris, while Hedrick sat down and took his skates off. At the awards ceremony, Hedrick smiled and halfheartedly waved his bouquet. Davis raised both arms, smiled and waved to the crowd. Fabris jumped onto the top spot, in the middle of the Americans, and waved in all directions. After the bouquets were presented, Davis and Hedrick stepped up and joined Fabris. Davis tousled the Italian's hair and they talked to each other. Hedrick stared straight ahead. There was no traditional handshake between the medalists. Davis’ appearance and attitude on the awards platform was a marked improvement from his behavior in an interview with NBCs Melissa Stark earlier in the Games. If people watch the sport because of that and find they like it, it will be good for us, but if it's blown into this big thing, all the negative things, it's not good. Davis’ accomplishment and achievements have never been a question. His attitude and behavior has. However, Hedrick should get over the fact that Davis ditched on the relay. That is history. Today was a chance to mend fences and put on a new face for USA Speed Skating. Time will tell if either skater can move forward. It appears that one skater tried and the other came up short. And an Italian snuck by both of them to take the top prize. After all, isn’t that what competition is about? Del Rio's Todd Hays and the rest of The United States Men’s bobsled team was back at the track after having a day off after the two-man race to start official training for the four-man. Hays, Pavle Jovanovic (Tom’s River, NJ), Steve Mesler (Buffalo, NY) and Brock Kreitzberg (Akron, OH) are teamed up as USA 1. They had a push of 4.91 (third fastest) and a down time of 55.94 (ninth fastest) on the first run. Run two would see a start of 4.88 (fastest of the heat) and a finish of 56.07 (second fastest) just .03 seconds off of the fastest time put down by Germany’s Andre Lange (56.04). The team will be back at the track for training runs 3 & 4 starting at 5:30 p.m. tomorrow night with Hays going off sixth and Holcomb seventh. Hays was quoted on his straegy in the four man event. "It will be the same thing as the two-man, get the sled down the hill without beating up too many walls." In a story from Chicago Sports.com, an explanation is given for the curt and abrasive attitude of Shani Davis after winning his gold medals in the 1000 meter speed skating event. He had to go to the bathroom. I repeat: HE HAD TO GO TO THE BATHROOM! That seems like a plausible explanation of his behavior and attitude with NBC’s Melissa Stark. I would take that explanation from some people but, as always, the plot thickens. In an earlier posting, I stated that after Davis’ exchange with Stark, he turned and walked away, smiling and laughing when approached his entourage. The smile and laughter was barely visible. You had to be paying attention, but it did happen. Sources further report that Davis was indeed angry. He was angry at NBC host Bob Costas for critical remarks about his (Davis’) decision not to compete in the team pursuit on Wednesday. But there is still the statement that he had to go to the bathroom. One might take that explanation at face value. The cold hard fact is that after the exchange with Stark, he stepped in front of Dutch television cameras for an interview that was warm and engaging by those who viewed it. Seems he must have a mighty good bladder. Remember, he is sponsored by a Dutch bank. I guess he felt he could hold it for the Dutch but not for his own country. An Italian prosecutor told Austrian television that Italian prosecutors found more than 100 syringes and 30 packs of drugs, including asthma drugs and antidepressants, in a raid on Austrian Winter Olympic bases. Also found were blood testing and blood transfusion equipment in Saturday’s raid of Austria’s biathlon and cross country ski teams. The raids were coordinated in cooperation with the International Olympic Committee and the World Doping Agency. The plot thickens! Who will be caught next? Do you think some in Turin are sweating that they may be found out? In a copywrited article from The New York Times it has been stated that the Italian police that raided the housing of Austrian Nordic skiers from syringes and unprescribed medicines. A bag containing these and other items were thrown out a window and recovered by Italian police. Perhaps since the International Olympic Committee seems to drag its feet on drugs in the Games, the Italian police and government will take up the slack. With the NBA and their entire entourage in Houston this weekend for the annual All Star Game, partying and socializing is more on the minds of those involved than the actual game. What other event brings out all the celebrities, attending massive parties and social events, just to see who else is there and to be seen by others. The actual fan, who loves basketball, cannot hope to get into the game. With tickets from scalpers going for upwards of $15,000, it is an event for the elite who have no more interest in the game than they do in standing in line to get a coke. Watch it on television if you must, but you will get better action watching the Winter Olympics or Desperate Housewives. In an interview posted today with ESPN, it was stated that USA Olympic gold medalist Chad Hedrick didn’t congratulate 1000 meter gold medalist Shani Davis after his victory on Friday. ESPN also stated that Davis had convincing beat Hendrick in the event. Checking the official results on Torino Olympic website, http://www.torino2006.org, the margin of Davis’ victory over Hedrick was a scant 56 hundredths of a second. Hedrick finished in sixth place. What ESPN neglected to mention was that in the 5000 meter event, in which Hedrick won the gold medal, Davis finished in seventh place, 8.40 seconds behind Hedrick. How can a 56 hundredths of a second be decisive, but 8.40 second not? Many are raising the question that Hedrick didn’t congratulate Davis on his victory. My question: where was Davis’ congratulation of Hendrick’s performance in the 5000 meters? Seems to me if you want congratulations, you should give congratulations. Perhaps Shani needs to look towards himself for the source of his speed skating problems. This young man and his supporters just don’t get it. My guess is they never will. Del Rio’s Todd Hays and brakeman Pavle Jovanovic finished in seventh place in the 2-Man Bobsled at the Winter Olympics in Turin, Italy. Hays’ sled was in sixth place after the first two runs, but slipped one place in the standings after the second day of competition. Hays’ combined time of 3:44.72 was 1.34 seconds behind gold medalist Germany 1. Hays and team will return to the ice for the four man bobsled event on February 24-25. It seems Hays made the decision to use cold-weather runners on his sled during the first two runs on day one of the competition. "I took a gamble. "I'm already a silver medalist. I'm trying to win a gold. So I went for it, and it cost me a couple of places. ... I may have dug myself into a hole right now that I can't get out of." Hays elected to use his cold-weather runners, because the ice temperature had been anywhere from minus-9 to minus-15 Celsius all week. But the sun came out after a snowstorm and warmed the track to minus 3.9 degrees at the start of the race. "What I don't want to do is come across like I'm making excuses," Hays said. "I need to get it done with whatever runner I'm on. I'm not going to sit here and say it's all runners. I needed to drive better. I needed to find a way to get it done, and I didn't do that." In this writer’s opinion, he was trying to do what he could to win. Win for himself, his teammate, and his country. It is a shame it didn’t help, but at least he gave it his all. That is a refreshing change from the attitude of some on the USA Olympic team. 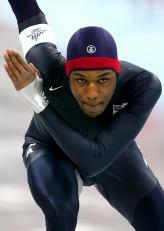 Was something amiss in Shani Davis’ interview with NBC after his gold medal performance? Many out there think so, and as usual, so do I. When Melissa Stark interviewed Davis after his gold medal performance, it was obvious to many that something was not right. Davis answered in short statements and looked away when she interviewed him. As the interview concluded, he turned to walk away, looked at his coach and support staff, and started smiling and laughing. You had to look quick to catch it, be he did do it. Was he playing games and showing his attitude during the interview? Only Shani knows. If he was nervous, as some out there have expressed, then why did he smile and laugh when he turned away? But if this young man expects to capitalize on his achievement, he needs to get some training in public relations and embracing the masses; because it is clear to me he just doesn’t get it. I HOPE HIS GOLD MEDAL HAD IT'S SEAT BELT ON! Hours after winning the men's figure skating title by a huge margin Thursday, Russian gold medalist Yevgeny Plushenko was involved in a car accident on the way to the airport Friday morning. On Plushenko's Web site, his agent, Ari Zakarian, said Plushenko was trying to catch a flight to St. Petersburg, Russia, from Milan so he could attend a celebration that St. Petersburg was holding in his honor. Plushenko was traveling with his coach and his choreographer; a representative of a Russian Olympic team sponsor was driving, Zakarian said. No one was injured. 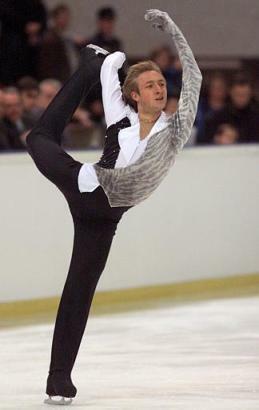 Plushenko will be back in Turin in time for the exhibition skate next Friday, Zakarian said. Now imagine if he had been riding in a car in Houston headed for the airport. With all the Houston traffic, he may not have made his plane. Five time Olympic gold medalist Eric Heiden stated in an interview with NBCOlympics.com that speed skater Shani Davis could have participated in the team pursuit event with very little trouble. That's a tough call. I think it would have been very easy to participate and come back well rested for the 1000m, and maybe even to use that race as training. The biggest thing is experience. He missed the opportunity to race here at the World Cup event in December, so other skaters have the sense of what it's like to race here -- at race speed. In the pursuit, you're skating fast laps, so it would have given him a sense of what it's going to be like for the 1000m. It just would have helped to get a race under his belt, since he wasn't here in December. Heiden, who is a USA team physician, further elaborated on Davis’ decision. From a fatigue standpoint, I can’t imagine that a race on Wednesday, only one round, would limit his ability to race in the 1000m on Saturday. That’s a long time. Physically, I think he was more capable of doing both. And he missed a great opportunity to test the ice at race speed. What does Eric Heiden know? He only won five gold medals in speed skating in the 1980 Olympics in Lake Placid, New York. He is the team physician for the USA speed skating team, and without a doubt knows more about speed skating that anyone on the planet. He is the best speed skater in the history of the sport and he won his five gold medals on an outdoor track that was built for the 1932 Olympics. Could Shnai Davis have accomplished the same feat? The world will never know, but I think not. Shani Davis Wins Olympic Gold Medal, But At What Price? 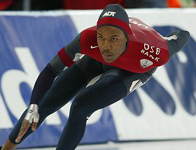 Shani Davis won the 1000 meter event in speed skating at the 2006 Winter Olympic in Turin, Italy. AOL has a poll on its web site to select the biggest star for the USA up to this point at the Olympics. Davis is winning with fifty-three percent of the vote. Does anyone recall that this guy ditched his teammates earlier in the week by “choosing” not to participate in the team pursuit event? That decision perhaps cost the USA a medal. Davis and his mother have had an acrimonious relationship with US Speedskating and a sometimes tenuous rapport with his teammates. This is just another case of an athlete placing himself above his team and teammates. How can we celebrate an athlete for his performance when he acts like that? He won a gold medal at the Olympics, but his attitude and commitment to his country and his teammates speak volumes about him. Those volumes add to the negativity of him and lessen his achievement. Will the athletes of the 21st century even learn? Learn that the team is more important that the individual. Count me as one who will not celebrate this athlete’s performance. I am sure there are many more who feel the same. 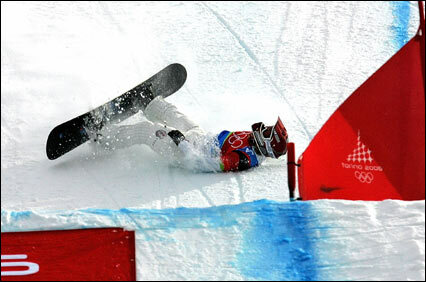 USA’s Lindsey Jacobellis lost the gold medal by pulling a stunt with her board in the final leg of the women’s snowboarding cross at the Winter Olympic in Turin, Italy. Grabbing her board as she was jumping the final hill, she fell and allowed the second place boarder to pass her and "take" the gold medal. She was hot-dogging it and it cost her the gold medal. In her interview with NBC after the event, she said she had no regrets. If you have not noticed in the past 10 years or so, the IOC has been adding new sports and some of them, IMHO, are attempts to gain new viewers and money to the Olympic movement. Snowboarding was one of these sports. Does the Olympic movement need the influx of this type of sport when “HOT-DOGGING” is the norm? That is a question that some are asking. Women's ice hockey? OK, I can see it. Snowboarding???? My decision is still out whether that was a good move or not. The USA has won most of the medals, but who else in the world does it as much as Americans. The kid who won the half pipe seemed pleasant enough, but he is also a skateboarder, and some are proposing adding skate boarding the Olympic program. NBC is keying in on these newest Olympians, and it may be hurting their coverage. Bode Miller...GIVE ME A BREAK...He hasn't won yet, and is suppose to be our best skier. Seems our little girl snowboarder got caught up in the moment! Her moment in the spotlight, and she BLEW IT. What happened to the days went it was an honor to represent your country in the Olympics. If I had been that young ladies coach, I would have certainly said something to her about her performance and attitude in that race. Give me the days when the USA and the USSR battled in the Olympics. Could you see any Olympian today refusing their medal like the 1972 USA basketball team did? Very few, I think...Most are only concerned with their own performance and what the Olympic Games CAN DO FOR THEM!!!!! I will not even comment on Shani Davis’ decision not to skate in the team pursuit, a decision that cost the USA a gold medal. At least not right now. Michelle Kwan withdrew from the 2006 Winter Olympic Games this morning. She has given so much to the sport of figure skating, and to have her latest quest end like this makes one wonder. I am very fortunate that I met her at the 1994 US Olympic Festival in St. Louis. I can still remember that meeting today as I watch her of USA Network's Olympic Ice show. She tried to hold back her tears as she spoke of her decision. After a while, one could see a few tears flowing down her face. As a former athlete and a current coach, I do know how she felt. She spoke about being honest with herself and her love for her sport. She stated she wanted the best for the sport. She stated she was going home to California and would support and cheer for the USA from there. She added she didn't want to stay and be a distraction. What a class act!!! I knew that fact when I first met her. Why can't all athletes be like that? It would make sport a whole lot better. I bid Michelle farewell, but not goodbye. She WILL be back. In what capacity, I cannot say. She is needed in the world of sport. The USA, Olympics, and the world are a much place with her. Spring, Texas' favorite son, Chad Hedrick, won the gold medal in the 5000 meter speedskating event in the Oval Lingotto at the 2006 Winter Olympics in Turin, Italy. Hedrick skated in the 12th of fourteen pairs, and his winning time of 6:14.68 was 1.72 seconds ahead of silver medalist Sven Kramer of The Netherlands. The gold was the first of the Games for the USA and kept Hedrick on track to match Eric Heiden's five gold medals from the 1980 Winter Olympic Games in Lake Placid, New York. Texas just keeps producing world class athletes. Even a lack of snow in Texas doesn't hinder it's citizens for excelling in winter sports.